The Custom Box is perfect for those that know exactly what they want in their subscription. You will have complete freedom to shop from our web store to fill your box. 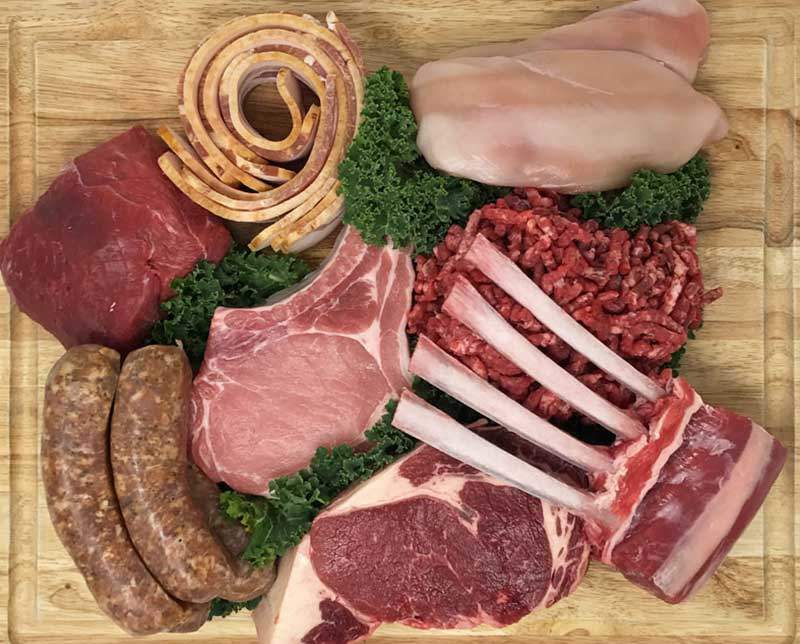 Beef, pork, lamb and chicken will all be at your beck and call, as well as our incredible bacon and sausages. The Small Custom Box costs $50 and you get $57.50. Show the savings That’s a 15% savings!. The Large Premium Box costs $100 and you you get $115 to spend. By making a 6 month commitment, you get all that savings and 10% off of anything else you purchase from us. You can choose from Weekly, Bi-Weekly or Monthly pick-up at any of our Farmers Markets or at our Butcher Shop inside Community Market in Sebastopol. Home delivery will be available soon, including overnight delivery anywhere in California, for a small fee. Please let us know if you would like to be notified when this option is available. Due to the nature of the Custom Box, orders are placed at least 48 hours prior to pick up and are subject to availability of the cuts you order. The further in advance you place your order the more likely we will have what you want. In the event we are out of stock on an item, we will suggest a similar substitute. Each subscriber establishes a “Default Order”. These are cuts that we will pack for you in the event that you forget or just don’t have time to place your order in the web store prior to 48 hours before pick up. This ensures that you will always get a selection of cuts that you are sure to love! Communication is key! Let us know ahead of time if you need to adjust your pick up schedule. Any box not picked up within a week will be restocked and the member will be charged the $25. The biggie is if you need to cancel your commitment. All our subscriptions are pay as you go. In the event that you wish to cancel prior to the end of your commitment, you will be billed for the LESSOR of the balance of your commitment or the amount you saved by being a member. Cuts are chosen from our freezer stock, although fresh cuts may be included from time to time as available.